I love shoes and I do own a nice small collection of designer shoes, but there are still some iconic pieces missing like the beautiful silk pumps with signature heel shape or the zig-zag laced sandals from Nicholas Kirkwood. It all started with Sarah Jessica Parker. As Carrie she had already made me fall in love with Manolo Blahnik and during her movie promo tour in 2010, she introduced me to the beautiful world of Nicholas Kirkwood. The young designer started with his first shoe collection in 2005. Rodarte was the first designer house that recognised his talent and collaborated with him for the brand’s catwalk shoes. In the meanwhile he has added names like Erdem and Peter Pilotto to his list. The designer is high in demand lately with interesting new collaborations and a brand expansion coming up. The shining star of Nicholas Kirkwood got noticed by Victoria’s Secret and together with Swarovski he created all the shoes for the recent Victoria’s Secret Fashion Show. A few days ago, he launched a limited-edition shoe with velvet and gold chrome inspired by Chambord, the liquor brand. Who would have guessed that this successful award-winning shoe designer owns only 3 pairs of shoes himself?! That might change very soon, as he is working on a men’s collection. To put a face on the customer he has in mind for this collection, he named Jamie Hince. I am looking forward to how he will incorporate his signature use of colour and architectural elements into his men’s shoe collection. And after that maybe adding a line of bags to his brand? 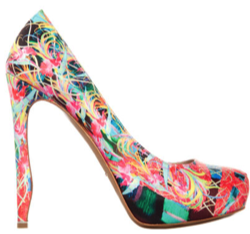 That would definitely complete the beautiful world of Nicholas Kirkwood.